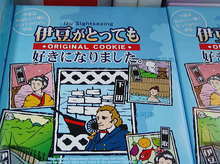 This morning, when I went to Shimoda station, I found this in a souvenir shop. This Japanese means "I became to love Izu very much." Yes, this is a cookie for a gift. At that time I found the another similar name "I went to Izu."…. This entry was posted in Shopping on 2006年5月31日 by izusakuraya. Today it was a really beautiful day !! Besides it was very hot, the sun gave us great sunshine. 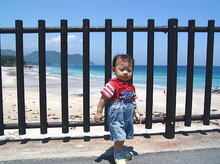 When my wife, son and I went to Shimoda, I took this picture at the bus stop "Shirahama Kaigan" with my son, Yuuki. While I was taking a picture he cried "Umi, umi !! "many times. "Umi" means "Sea". 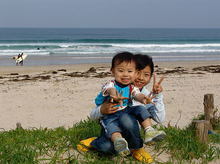 This entry was posted in beach, Family on 2006年5月30日 by izusakuraya. After I went to the school to pick my daughter up, we went to the beach for a while. Today we could see a lot of surfer in the beach, because they had good waves for surfing. Probably they were satisfied with these waves. I want to see the picture that I took ….. 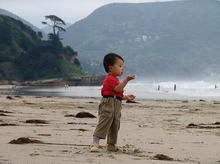 This entry was posted in beach, Family on 2006年5月29日 by izusakuraya. Rainy season “Tsuyu” will come soon. Today my children and I went to the beach after 10 days. In the beach we could see a lot of seaweeds which were taken up from the sea by big waves. By the way the rainy season "Tsuyu" has already visited in south Kyushu area. This entry was posted in beach, Family on 2006年5月28日 by izusakuraya. 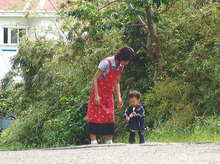 After check-out of guests my wife and son took a walk for a while this morning. My son found a flower of dandelion. This is his favorite flower. And after that he found a bug at the side of street. This entry was posted in Family on 2006年5月26日 by izusakuraya. This entry was posted in Meal, Sea on 2006年5月24日 by izusakuraya. From yesterday, the students who came from the United States are staying at Sakuraya. 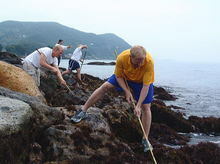 Today, on a second day, they had Exploring and Sea caving at Shirahama beach. So I got into their exploring in this afternoon. They started to walk from south area of the beach. 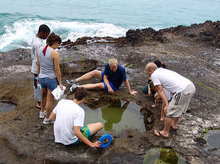 In this picture the professor are explaining about the sea animals and the other things on the rock…. This entry was posted in beach, nature on 2006年5月22日 by izusakuraya. Summer has come to Shirahama beach. Yes, summer has come to Shirahama beach at last. Today it was a hottest day this year. 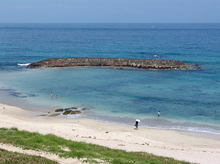 I thought that there were some people swimming at the beach, so I went to take pictures to Shirahama Chuou beach. Yes, I was right. I could see many people swimming…….. This entry was posted in beach on 2006年5月21日 by izusakuraya. Do you konw what Sekisho is ? Sekisho is a one of checkpoints where the goverment of Edo era stopped every traveller. 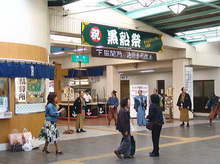 During Black Ship Festival the Railway Company, "Izukyu Line" changes Shimoda station like this picture every year. And there are many people wearing costumes of Edo era……. . This entry was posted in Travel on 2006年5月20日 by izusakuraya. Today It was rainny day but I went to "Ryosenji Temple" in Shimoda, and I found a lot of flowers blooming. 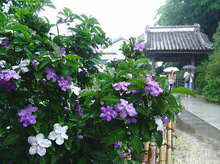 Now "Jasmine Festival" is taking place in this temple, and about 1,000 trees of Jasmine are blooming on both side of a small path. From today "Black Ship Festival" is held in Shimoda city, so many foreigners were in the city….. This entry was posted in Flower, Travel on 2006年5月19日 by izusakuraya.